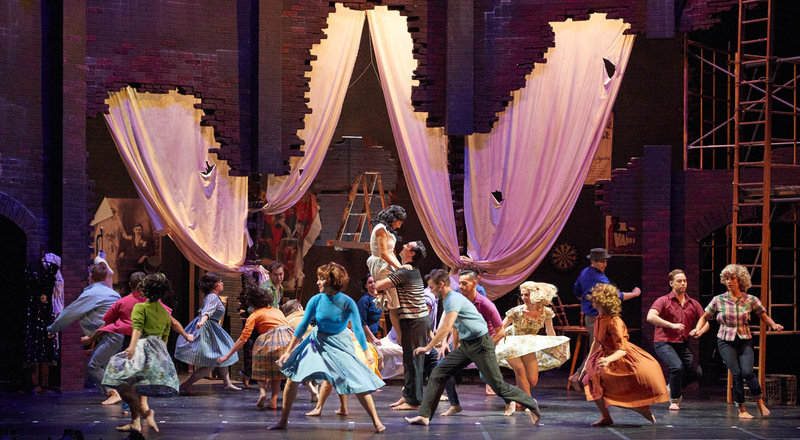 DORCHESTER – Fifty-eight years after it first appeared on Broadway, the musical “West Side Story” is still a staple of the musical theater canon. And while the score by Leonard Bernstein and Stephen Sondheim is generally acknowledged to be one of the best in theatrical history – spawning a half-dozen songs that will live forever in the Great American Songbook – the show became notable for other reasons. 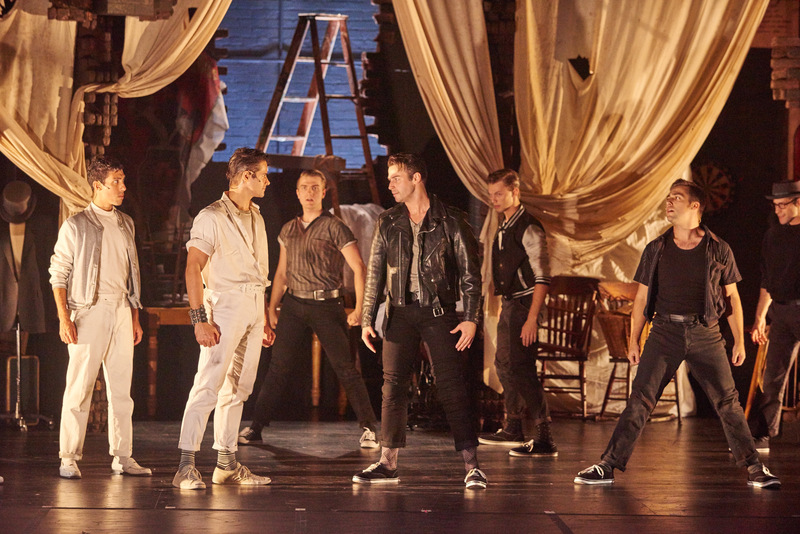 The book by Arthur Laurents made “West Side Story” one of the first major musicals to have a less-than-happy ending, based as it is on the Shakespearian tragedy “Romeo and Juliet,” updated to 1950s New York City, with the Jets and Sharks standing in for the Capulets and Montagues. Chita Rivera as Anita in the 1957 Broadway production and Rita Moreno as Anita in the 1961 film became stars at a time when Latina actresses struggled even to play Latina parts. 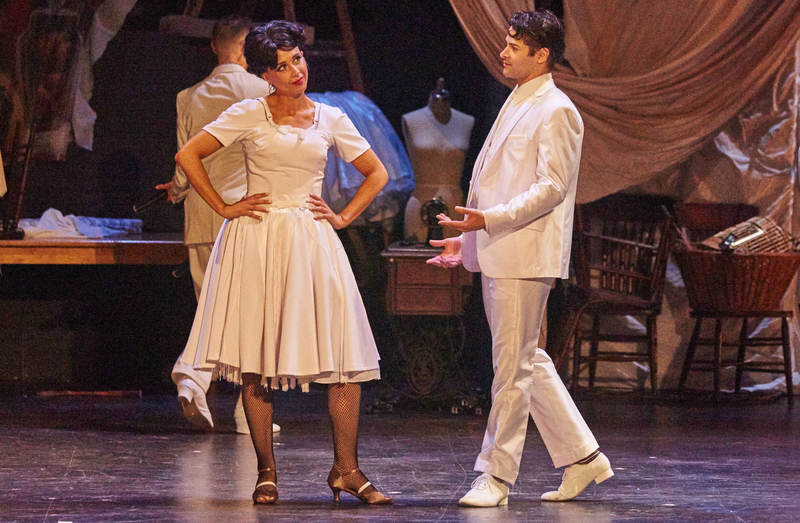 The best part of the Fiddlehead Theatre Company production of “West Side Story” is the choreography by Wendy Hall, which threatens to leap off the stage of the Strand Theatre into the audience. This “West Side Story” brims with great, unflagging energy. The Jets – white kids of various ethnicities such as Italian, Irish, Polish, etc – are bent on defending their turf from what they see as a threat posed by more recent immigrants – the Sharks, a Puerto Rican gang. Against that backdrop, love blossoms between Tony, one of the Jets, and Maria, the sister of Shark leader Bernardo. Jeffrey Zicker’s Tony is a bit too understated for my taste. His Tony doesn’t have the passion and fire I’d like to see from the character – although he sings well enough – and the show really doesn”t take off until Kim Corbett as Maria joins him, in the soaring duet “Tonight,” one of the vocal highlights. Corbett’s Maria has the requisite coquettishness and innocence as she enters a forbidden relationship with Tony, who is working his way out of gang life while working part-time at a drugstore. Theo Lenkicki’s Riff is a fine singer and dancer and projects the macho image of a gang leader while also dancing up a a storm. Director Stacey Stephens and Producing Artistic Director Meg Fofonoff have also focused on the hopeful musical number “Somewhere,” a place where Tony and Maria dream about escaping to, a place of love and beauty where prejudice and hate don’t exist, a place where Tony and Maria long to be together forever. The number is thoughtfully and beautifully staged by the entire ensemble. The cleverness of a very young Sondheim lyrics shines through in the lyrics for such songs “Gee, Officer Krupke” smartly performed by the assembled Jets. Daniel Boudreau is fine as the cynical, world-weary, racist cop Schrank. And while both the Jets and Sharks and their women are strong across the board, special mention to Lydia Ruth Dawson as Anybodys. Fiddlehead, as the resident professional theater at the Strand, has made great progress in taming the sound issues of the theater, an older building since refurbished that still presents issues for musical productions. Charles Peltz’s 23-piece orchestra – that’s right, I said 23 pieces – gives full voice to the Bernstein-Sondheim score and its many nuances. Mac Young’s design uses scaffolding and the upper boxes of the theater to suggest tenement balconies, and facades that can be moved quickly for scene changes. Bravo, Meg Fofonoff and Fiddlehead Theatre, for not “cleaning up” the language in classics such as “West Side Story.” Some who do this show and shows such as “Big River” (The musical based on “Huckleberry Finn”) have deleted language to protect modern-day sensibilities. Yes, racism was indeed prevalent in the 1950’s, and the issues that Laurents confronts in his book such as immigration and economic equality are playing themselves out on the political stage once again. A recent Opening Night was festive, featuring a trolley full of theater-goers who traveled from downtown Boston to find out that the Strand, located at Uphams Corner in Dorchester, is a great place to watch a show, parking is free and plentiful, and that Fiddlehead’s reputation for polished, professional productions is intact. The Fiddlehead Theatre Company production of “West Side Story.” Based on a conception of Jerome Robbins. Book by Arthur Laurents, Music by Leonard Bernstein, and Lyrics by Stephen Sondheim. Entire original production directed and choreographed by Jerome Robbins. Directed by Stacey Stephens. Scenic design by Mac Young. Choreography by Wendy Hall. Costume design by Stacey Stephens. Music direction by Charles Peltz. Lighting design by Dan Jentzen. At the Strand Theatre through Oct. 25. http://www.fiddleheadtheatre.com.